This project received funding from a large-scale Artists in the Classroom grant. 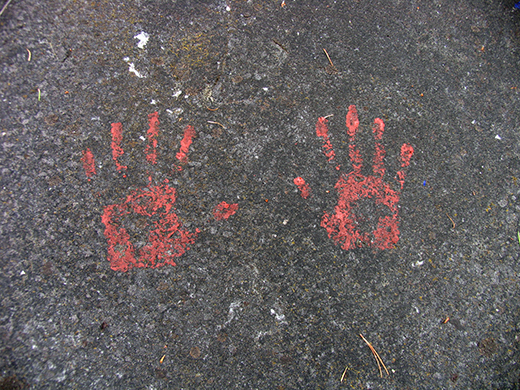 This blog post was written and submitted by artist Charlotte Erlandsson, who worked on this project with Grade 7-12 students in the Aboriginal Education Program at Mount Sentinel Secondary in South Slocan, BC. The project Charlotte describes here was just one part of a larger creative learning endeavor entitled "How Do the Valhalla's Influence Who We Are?" that the school developed with Charlotte Erlandsson and artists Richard Reeves and Miriam Needoba. This post is part of an ongoing series chronicling the progress of select AIC grant recipients. This exciting AIC project combined learning about ancient petroglyphs and pictographs with art making — drawing, painting and photography. 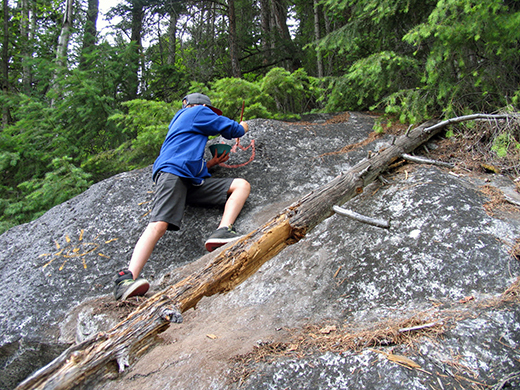 We studied petroglyphs from Scandinavia, Spain, France and Australia and visited local pictographs in our own backyard, here in BC's Kootenays. Our first field trip was to Touchstones Museum of Art and History, where we learned more about the local pictographs and who made these mysterious rock art images. When the young people of the tribe were to become women and men, they undertook a vision quest where they sat alone for days without food. During this sacred time, they communicated with the ancestors or spirits, and waited to feel what their dream or gift was for the tribe — what they would contribute to their people. When they had found it, they would paint it, usually on a cliff nearby. 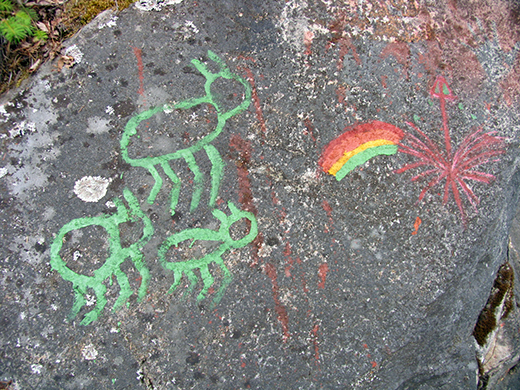 The students kept this knowledge in mind when, back in the classroom, they started to explore and play with petroglyphs through sketching and drawing. They created their own pictographs, but also drew old ones. Then they started working on the big canvas, the mural, which represents a contemporary rock wall. 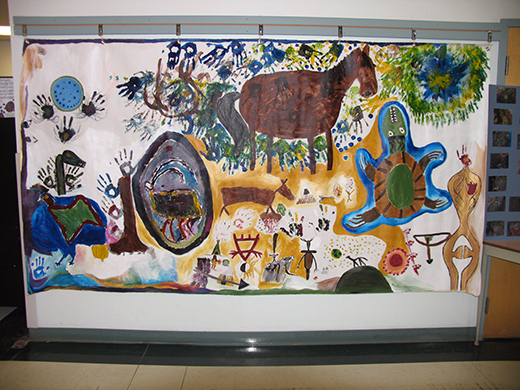 The group of students freely expressed themselves on the mural, inspired by the petroglyphs and pictographs from our ancestors, but also by their own identities and dreams. 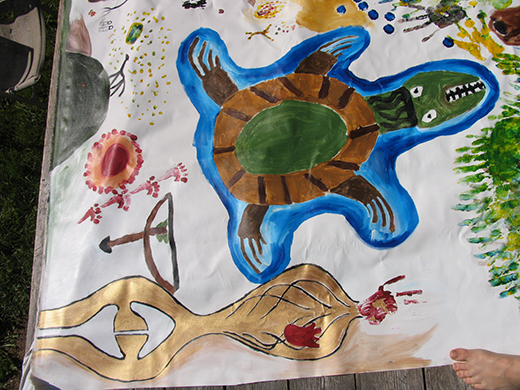 The students also got to paint their pictograph on a t-shirt, a project coordinated by Aboriginal teacher Toni Appleby. On our second field trip, we went to Creston, where we visited real pictographs made by the ancestors of the Kootenay area. The students got to photograph with a 33mm camera (with real film!) as a medium to focus on what we see and observe. 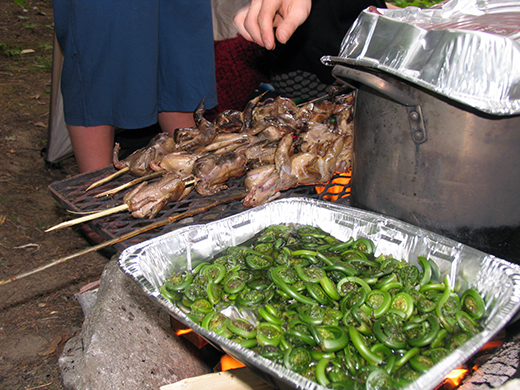 The last field trip was to a forest near Nelson, where we enjoyed a final feast of traditional foods: quail, corn, fiddleheads and watermelon. 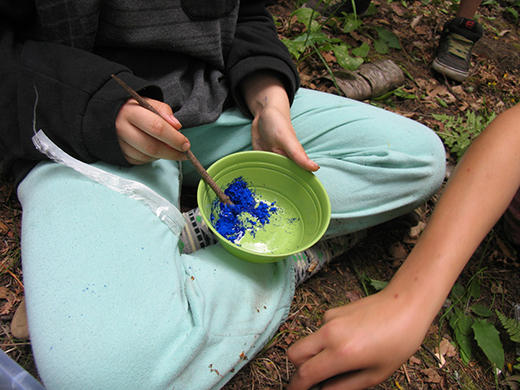 We made our own paints by mixing natural pigments with egg white, and the students got to try "real" rock painting. These natural paints were water soluble and will naturally dissolve from the rocks. The students made their own pictographs with the natural paints on rock walls. 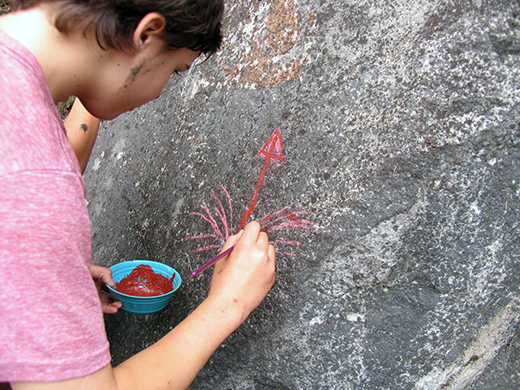 The students quickly noticed how difficult it was to paint on the rough surface of rock, but they expressed great pleasure and joy throughout the experience. This project was supported by an Artists in the Classroom grant disbursed by ArtStarts in Schools and funded by BC Arts Council and the Province of BC.